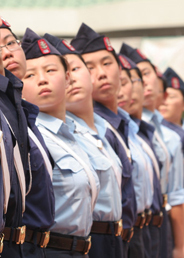 The Boys’ Brigade, Hong Kong was established in 1959. As a Christian uniformed group, we strive to nurture children and teenagers aged 3 to 21. Through our Christian education and leadership training programmes, young people can build up positive attitude and good character traits. Our whole-person training system can also help bring them up as servant leaders that can use their talent to create an energetic and harmonious society. Apart from Uniformed Group Service, we also provide Professional Training Service, Character Nurturing Service, Social Work Service, Waste Recovery Service and Mainland Social Work Supervision Service.